A continuous reward schedule is very useful when we are teaching our horse a new behaviour. Rewarding every effort in the beginning, encourages our horse to stay focused on us and will help him to keep offering new behaviours. In this stage of training we want the horse to expect a reward. As soon as the horse masters the new behaviour and we’ve put it on cue, we should change our reward schedule. If we don’t change our reward schedule and we keep using a continuous schedule of reinforcement, we become way too predictable. Our horse will lose interest in improving his efforts. He knows exactly what you ask and when his reward is coming. He probably will also know what reward you will be giving him, too. If the reward doesn’t change or the reward schedule stays the same (most people have a schedule of 100% chance of a click and reward), the reward ‘wears off’. Chances are the horse’s performance will deteriorate: he will try to find the least amount of effort he needs to exert to still get the reward. His enthusiasm simply fades and the training stagnates. In order to keep your horse engaged in training it helps to give the animal the feeling he can influence his environment. When the reward schedule and the rewards are predictable, his actions don’t seem to influence you/the rewards anymore. This is why it is important to keep the horse ‘guessing’ when and what kind of reward is coming. There are several ways to become more unpredictable in your reward schedule in order to stimulate your horse. Carry low and high value treats. You can reward good tries with lower value treats and excellent performances with high value treats. Don’t forget the power of rewarding with a jackpot. A jackpot is a very large (think one or two hands full of treats) and/or a very high value reward that is only given on special occasions. Best thing to do after a jackpot is to give the horse a break, so you will end training this specific behaviour on an excellent note. You don’t have to stop your training that day entirely, only that specific behaviour. You can use a fixed ratio reward schedule where you only click and reward for every 2nd or every 5th good performance of a behaviour. Mind you, your horse can learn to predict a fixed ratio schedule. When that happens his behaviour may deteriorate for the performances that are ‘in between’ an expected click and reward. A variable ratio schedule means that it will be random when a behaviour (once it is established) will be rewarded. 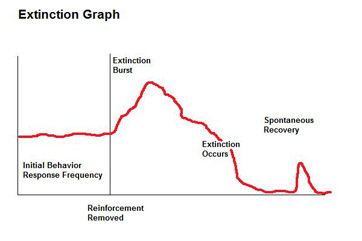 With a variable ratio schedule it will take a long time before a behaviour will become extinct. In what way do you use treats to keep your horse engaged in your training?